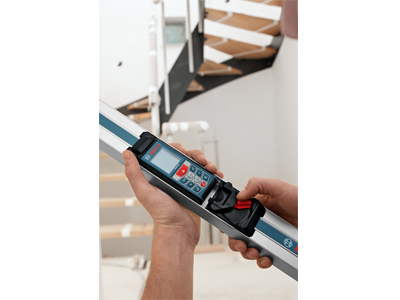 The Bosch GLM 80 + R 60 Laser Measure with 24 In. Digital Level Attachment unite to produce an unrivaled combination laser rangefinder and digital inclinometer. This tool can calculate the incline of drainpipes, soffits and rails, and is designed for professionals such as roofers, contactors, plumbers and electricians to boost productivity. Once the laser is locked in, it enters digital-level mode for accurate angle measurements. On its own, the laser measure provides 1/16 In. accuracy at distances up to 265 Ft. 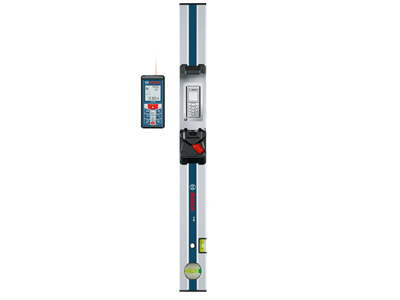 It can calculate indirect length measurement for obstructed objects, evaluate the shortest and longest distances from a fixed point, and determine the total area of numerous separate surfaces with a shared length or height. It automatically stores the last 20 measurements in memory. Powered by a rechargeable lithium-ion battery, the Bosch GLM 80 has a bright, easily read rotating display.